Discussion in 'Apple Products' started by Oubadah, Sep 14, 2018. ...because that was the only affordable phone with proper update support, thanks to Google killing Nexus. People said that Apple might drop the SE and keep the 6s to fill the niche, but now there's only the 7 which is priced much higher than the SE. The SE was also the only high quality small phone for people who like tiny phones. The SE was also the last iPhone with design language that really stood out to me (hate the rounded look from 6 onward), but that's just me. How cheap was the SE last year? I bought my 64GB one when they came out, it was priced at $499 but I got it for $50 with the subsidies. 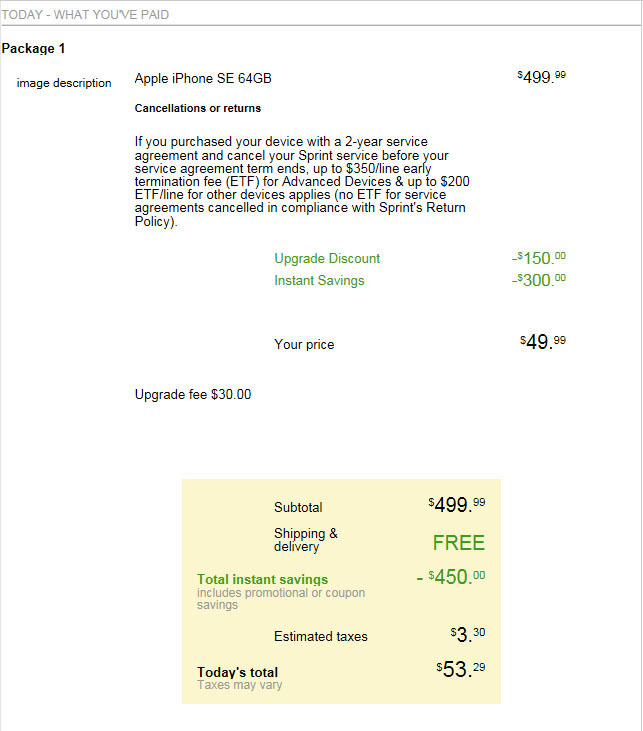 I purchased 4 iPhone SE units in early to mid 2017: The first was a 64GB unit being cleared just as the 128/32GB refresh was happening and it cost USD$290. I later purchased two 32GB units for my parents for the same price as my 64GB one, and then a 128GB unit for USD$550. Didn't know that they doubled the storage the following year. It appears that the new ones launched at the same price, $399 and $499. Was the $290 price you paid subsidized or was it just on sale for that price? Not subsidized. The $290 was a reduced sale price for the 64GB, and the normal price for the 32GB from most of the retailers in my area. I despise the larger phones. Was really hoping the would upgrade the SE to new guts but the same 4 inch screen. Guess I'll just have to get a new battery for my old one! Can you do the $29 replacement battery with Apple for the SE? Yep, $29 till December 31st of this year. The iPhone 7 has essentially become the SE- $449 for the 32GB version ($379 refurb through Apple) and this before any promotions or sales which might be available (eg BOGO, etc). I bought a SE last summer for my father and between the SE and the 7, the later is a much more capable phone with a better camera and larger screen for the same price. Where I live, the new price of the 7 is in no way comparable to that of the SE. The 32GB 7 is $800+. The 32GB SE was available $550 or less throughout 2017 (that was not the price directly from apple, but that was a stable price at a number of big-box stores). I'm talking about new phones, not refurbs. Do you live anywhere that can take delivery of an internet purchase? The iPhone 7 isn’t $800+ anymore. NZD$800, so that = USD$530 for the 7 vs USD$360 (or cheaper) for the SE in this country. When I got my iPhone SE from Best Buy, the iPhone 6 models were also on sale for not much more. I opted for the SE because phones generally just sit in my pocket all day, or attached to a charging cable at home. Phones, and even tablets as browsers are still really annoying to use with a lot of website design, on screen keyboards are annoying to do anything over a terminal with, and you spend more time dealing with auto-correct than you actually do writing an E-Mail under such circumstances. It seems like the primary purpose of a bigger screen (beyond status and shiny new toy) is bulk media consumption -- and as far as I know, mobile carriers all bilk you for data, and you're usually using your device while on WiFi somewhere in a situation that would have given better enjoyment with a tablet or laptop. Bigger screens just always takes me back to being at the Dallas aquarium a few years ago, with people standing there with full size Android and iPad tablets taking pictures of their kids. Or going to PAX Prime, and watching some people walking around with their big iPhones on sticks or video stabilizer devices. I guess 4.7" is the new ultra small going forward, and we're just going to have to deal with it after the latest iOS is no longer compatible. The phablet fans have won. Deleted member 88301 likes this. You're comparing launch price with a phone that's been out for over a year and a half. At launch the SE was incredibly inflated in NZ. The 7 will more than likely experience the same level of price drops after a year. I realize the 7 has been around just as long, but not at it's new "adjusted" rate. The SE on the other-hand is experiencing closing prices. If your complaint is price, that will be little deterrent given the same amount of time (a year and a half). These are the same jumps you'd always experience as a piece moves into obsolescence. The key here clearly is having a good understanding and memory of history. In this case, pricing history. The SE was often available on Amazon for absurdly low prices.. I have a 128gb Space Grey SE that I got for $189. That's an extreme example but it wasn't uncommon to see them for $250ish. It really was a gem, and I'm really sad they chose to axe instead of update it. You're saying that without a sense of history though. That was NOT the launch price of the phone. The only reason why the SE got to that price is because it was kept around for over 2 years. Any other Apple phone that is kept around that long and is near closeout is going to have absurdly low prices. The same will come around again with whatever the bottom tier phone is. Then it too will go away, followed by another wait for the same cycle to happen again. If you want a cheap iPhone, just wait for it to near the end of its cycle. The iPhone 7 near this time next year will have similar pricing. Not the same mind you, it will likely still be a bit higher. But that is also due to the fact that the SE was built to be a cheap phone, whereas the 7 and other current generation lines reach lower costs through volume manufacturing and less expensive processes. tl;dr: If they would have refreshed the SE, it absolutely would not be $250. It would be significantly higher. Right, it would absolutely be higher. When I say I'm sad they axed it I refer to the design, not the price point, sorry if that wasn't clear. As far as the cheap iPhone thing goes.. I've never seen iPhones get as cheap as the SE did around the 2 year mark without it being some awful 16gb SKU. And like you said, the SE was built to be cheap, the 7 once it reaches 3 years old still will likely be more expensive than an SE at the 2 year mark.. just the way it is. Apple has the stats (not only in units sold, but also in units currently being used). It will be interesting to see if this move ultimately hurts Apple's bottom line. The purpose of the SE was to be a low cost phone for Chinese but also perhaps more importantly, the Indian market. I assume they believe they are now better able to do that with their current lineup rather than creating a refresh of the SE. If there is a decline, they then have to figure out if it's worth the R&D resources and also the fabrication space to build another one. The SE coming to the US was incidental. I imagine that less than a year after launch the sales in western countries plummeted and it probably wasn't high to begin with (statistics showing most want bigger phones). There are a few SE faithful as part of a vocal minority. But I imagine outside of people wanting a really cheap iPhone, it wasn't nearly as popular as people in here imply. I would imagine the ratio of SE's to regular phones probably exceeded 1 in 1000. I realize my post has a lot of conjecture. But it's based upon thinking like Apple is: about the bottom line (or what sells) and also from what they've done in the past. I believe the SE was only in high demand immediately upon launch (My pre order was delayed like 3 weeks).. no doubt mostly by folks resisting the move to larger phones.. but I don't think it took long for that to dry up what with most people preferring larger phones. I guess that's probably why they became next to worthless (in terms of iPhone pricing anyway) rather quickly.. It all sounds reasonable to me, and I don't think anyone would argue otherwise that the bottom line is Apple's biggest priority.